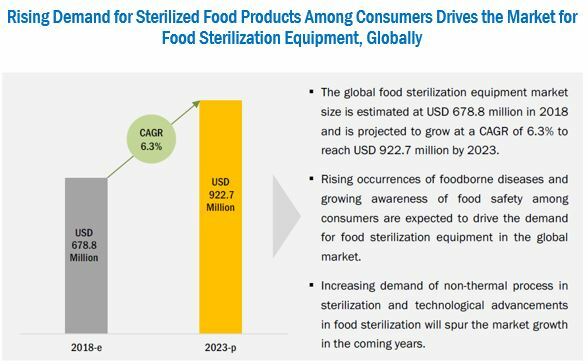 [119 Pages Report] Food Sterilization Equipment Market was valued at USD 637.2 million in 2017 and is projected to grow at a CAGR of 6.3% from 2018 and reach USD 922.7 million by 2023. The base year considered for the study is 2017 and the forecast period considered is from 2018 to 2023. The basic objective of the report is to define, segment, and project the global market size of the food sterilization equipment market on the basis of application, technology, process, and region. It also helps to understand the structure of the food sterilization equipment market by identifying various segments. The report also helps in analyzing the opportunities in the market for stakeholders, providing competitive landscape, and projecting the size of the food sterilization equipment market and its submarkets in terms of value. This research study involved secondary sources (which included directories and databases)-such as Hoovers, Forbes, Bloomberg Businessweek, and Factiva-to identify and collect information useful for this technical, market-oriented, and commercial study of the food sterilization equipment market. The primary sources that are involved in the study include industry experts from core and related industries as well as preferred suppliers, dealers, manufacturers, alliances, standards & certification organizations, and organizations related to all segments of this industry’s value chain. 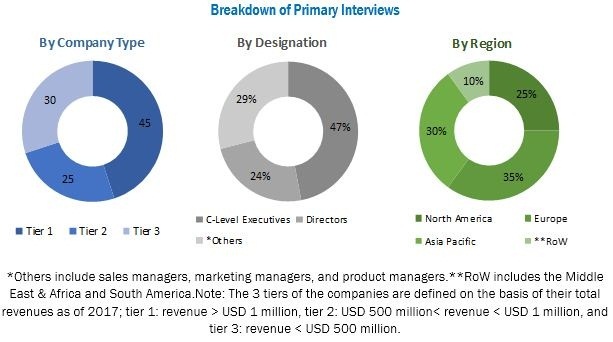 In-depth interviews have been conducted with various primary respondents, such as key industry participants, subject matter experts, C-level executives of key companies, and industry consultants, to obtain and verify critical qualitative and quantitative information as well as to assess future prospects. The following figure depicts the market research methodology applied while drafting the report on the food sterilization equipment market. Key participants in the food sterilization equipment market include sterilization equipment manufacturers and suppliers. The key players that are profiled in the report include JBT Corporation (US), Buhler (Switzerland), Cosmed Group (US), Ventilex (Netherlands), Surdry (Spain), Steriflow (France), Allpax (US), Hisaka (Japan), Systec (Germany), De Lama (Italy), Raphanel (Spain), Sun Sterifaab (India), and International Sonomecanics (US). 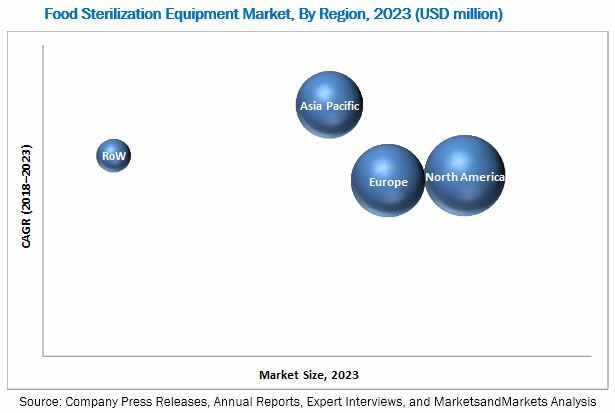 The food sterilization equipment market is estimated at USD 678.8 million in 2018 and is projected to reach USD 922.7 million by 2023, growing at a CAGR of 6.3% during the forecast period. Rising application of sterilization technology in food & beverage industry, increasing instances of foodborne diseases, and growing safety concerns related to food hygiene and contamination are the major factors fueling the demand for food sterilization equipment across the globe. Based on the process type, the batch food sterilization equipment dominated the market, holding the largest share in terms of value in 2018. The batch sterilization process is majorly used to control the temperature for reducing the contamination of microorganisms in food products. Due to these factors the batch process segment is projected to dominate in the food sterilization equipment market during the forecast period. Based on application, the food sterilization equipment market is divided into spices, seasonings, and herbs, cereals & pulses, meat, poultry & seafood, dairy products, fruits & vegetables, dried fruits & nuts, beverages, and others. The spices, seasonings and herbs segment accounted for the largest share of the global food sterilization equipment market in 2018. Spices and herbs contain compounds such as antioxidants that have anti-inflammatory, antifungal, antibacterial, and anticancer properties and benefit the consumer’s health. As food producers use spices and herbs as an important ingredient in most of their products, the demand for the food sterilization equipment remains high. To offer high-quality food products containing spices, herbs, and seasonings, manufacturers are focusing on improving the sterilization process, which in turn, escalates the demand for sterilization equipment for the spices, seasonings, and herbs. Based on technology, the food sterilization equipment market is divided into heat, steam, radiation, chemical, filtration, and others. The heat segment accounted for the largest share of the global food sterilization equipment market in 2018. Heat sterilization is one of the most widely used sterilization methods due to its easy-to-handle characteristic and low capital investment. The wide application of heat sterilization technology in the food & beverage processing industry is projected to drive the growth of this market during the forecast period. Heat sterilization technology is used to maintain long-term shelf stability for a broad range of high-moisture food products and ingredients. This technology is cost-effective as compared to the other methods and are preferred by many food manufacturing companies worldwide. Asia Pacific is projected to witness the fastest growth in the food sterilization equipment market during the forecast period. Emerging economies such as India, China, and developed country such as Japan have favorable market growth potential for sterilized food products, which has encouraged the food manufacturers in these countries to adopt strategies such as expansions. Through expansions, the companies are focusing on catering to the consumer demands and through increasing the production capacity of sterilized food products and raw materials such as spices, seeds, and herbs by using food sterilization equipment. The growing population and per capita income in China, India, Australia, and New Zealand are expected to drive the demand for sterilized foods & beverages. On the account of these factors, the growth of the food sterilization equipment market is projected to increase during the forecast period. One of the major restraining factors for the growth of the food sterilization equipment market is the growing concerns about highly processed food products and maintaining proper process control. The rise in the aging population in both, developed and developing countries has led to increasing health concerns. Due to these factors, preference for fresh and minimally processed food products, processed without using synthetic chemical preservatives, heat, or radiation, remain high among consumers. Key players such as JBT Corporation (US), Buhler (Switzerland), De Lama (Italy), Hisaka (Japan), and Systec (Germany) have been actively strategizing their growth plans to expand in the food sterilization equipment market. These companies have a strong presence in Europe, North America, and Japan. In addition, these companies have manufacturing facilities across these regions with a strong distribution network.